My living room is the most used/lived in room of the house, and I really feel it’s kind of neglected sometimes. A few weeks ago we moved the Barrister Lane tall bookcase we originally bought for the guest room over to the living room, and I think it’s improved the space. 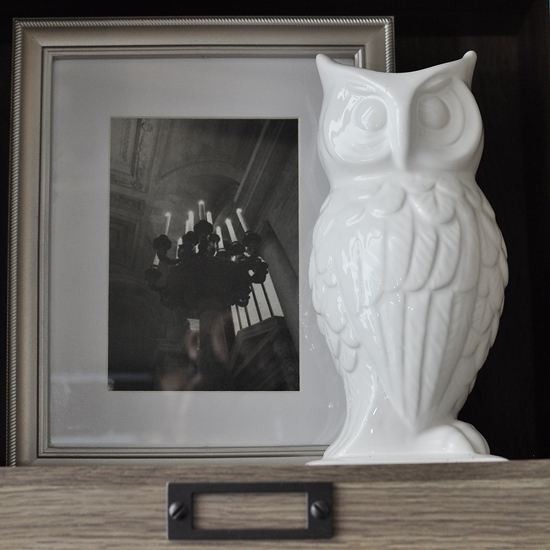 We used to have a chintzy console table in this spot, and now we have this beautiful bookcase by Sauder. It holds some photos I took on a NYC trip (I went to the library where Carrie and Big were supposed to get married in SATC), some of my beloved fall pumpkins and some cute photos of the pooch. 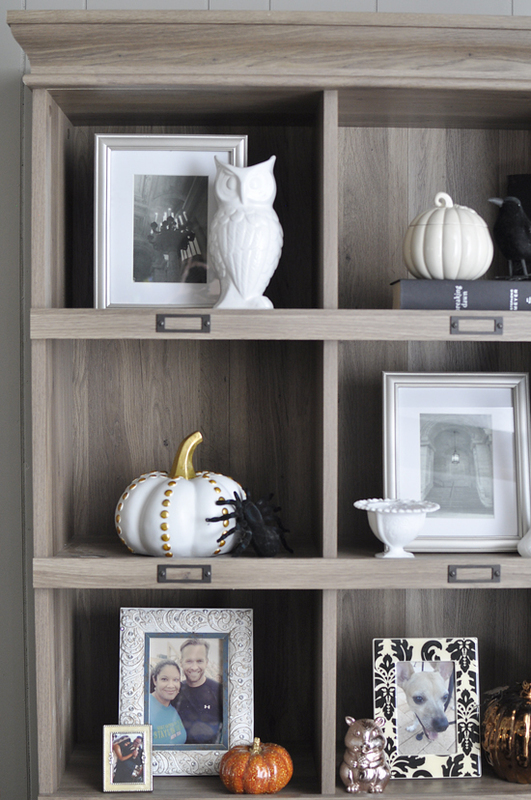 In this one photo above you can see two different ways of styling a bookcase by either using decor + photos or using your existing decor and working in some season pieces like spiders and pumpkins. A tip when buying furniture is to try to think of at least 2-3 places/rooms you could use the piece. This will give you options should you revamp a room or get tired of seeing everything in the same place all the time. In the photo below, we actually hid one of our two surround speakers behind the framed photo. You can’t even tell, can you? 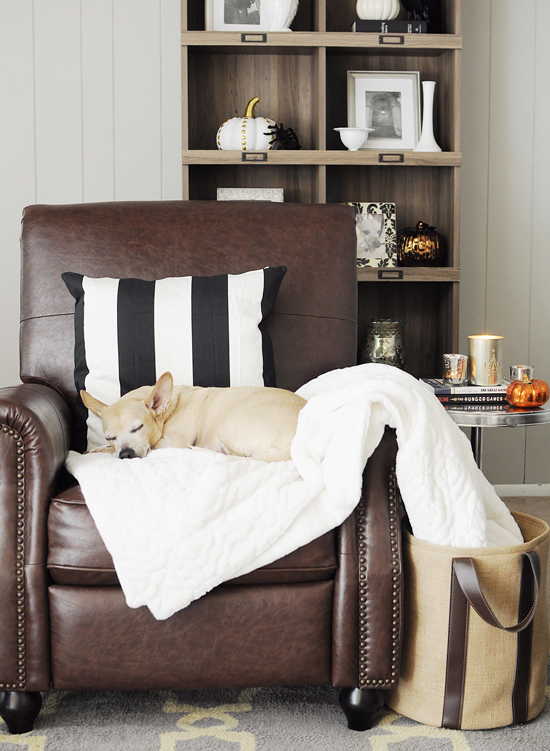 Although I love to decorate my home, I do find styling bookcases to be a bit difficult. Nothing ever looks right to me. Anyone else have that issue? 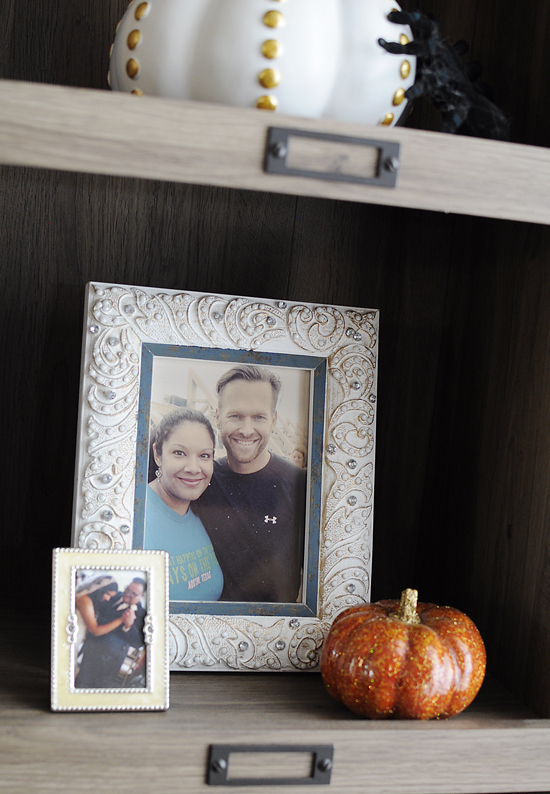 I just choose to focus on showcasing things I love…like this photo of myself and Bob Harper from 2011. Hardest. Workout. Ever. 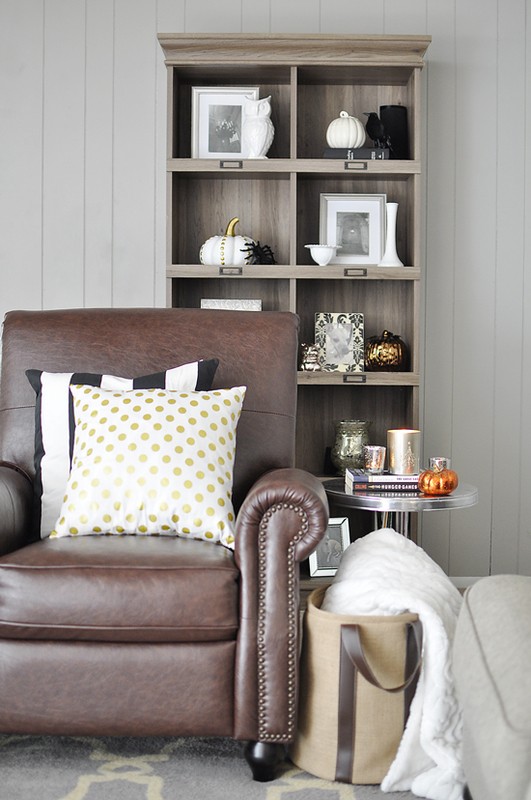 The Sauder bookcase helps set a neutral tone in the room, which is great because it gives all my metallic decor on the bookcase and in the room a chance to really shine. And Pee Wee seems to favor this corner of the living room–he’s in heaven on his luxurious blanket that he won’t let any of us use! I think moving the bookcase in here is really helping me get on track for finally “finishing” this room–I plan to add a gallery wall, recessed lighting, a bar, and hopefully a new chandelier and flooring sometime in 2015. 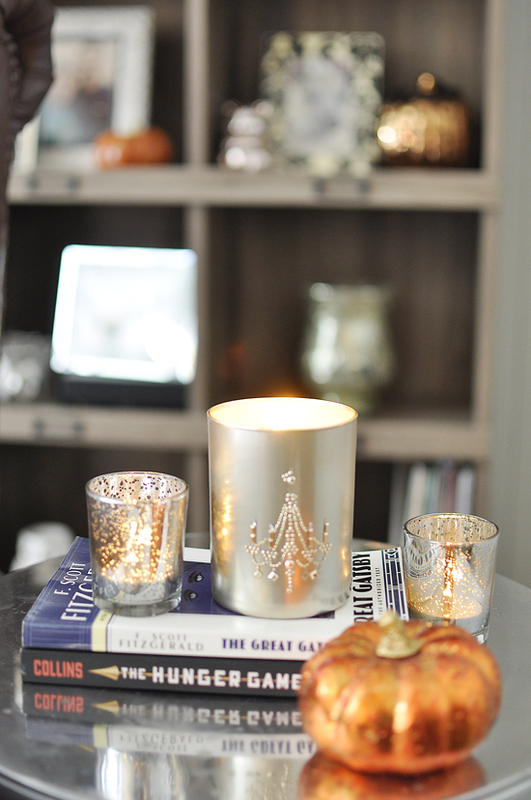 If you want to follow along with my ideas, check out my Home Inspiration Pinterest board! If you’re into the reclaimed wood look and need a big, beefy (heavy!) bookcase, I’d highly recommend this one. We’ve moved it to 3 different places in 2 different rooms and it’s held up beautifully. I’m thinking of adding mirror tiles to the back of each cubby to brighten it up a bit and make it glam. I’ll be back on Wednesday with chronicles of my latest curly haircut mishap. Why, oh why, was I born with the world’s most difficult curls?! Sigh.